Carl and Maud had plenty of opportunities to get to know each other; after all, they were first cousins. His father, Crown Prince Frederik, and her mother, Princess Alexandra, were siblings. (Carl's mother, Crown Princess Lovisa, was also Maud's godmother.) The couple were an intriguing royal match. Maud was nearly three years older than her fiance. While Maud was notoriously vivacious, Carl was described in contemporary reports as a quiet and unassuming prince with a career in the navy. In contrast, his elder brother, Prince Christian, was the dashing heir to the throne. 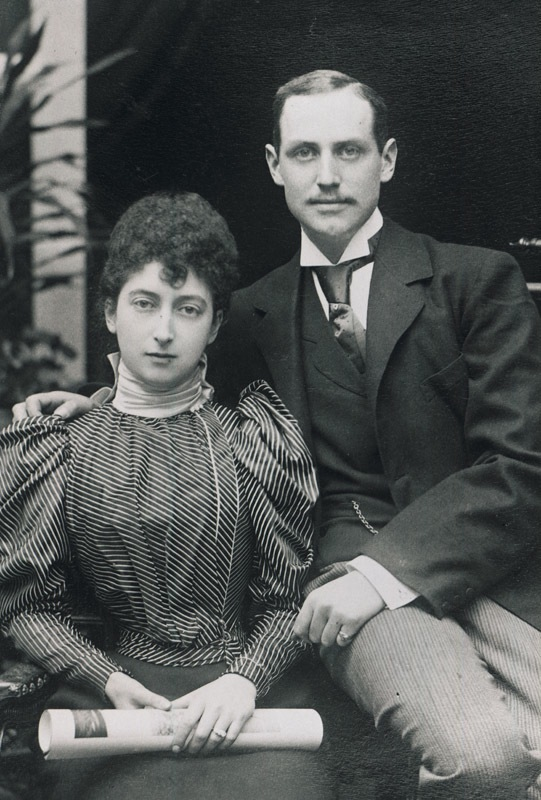 Carl and Maud were destined to play a minor supporting role in the Danish royal family. 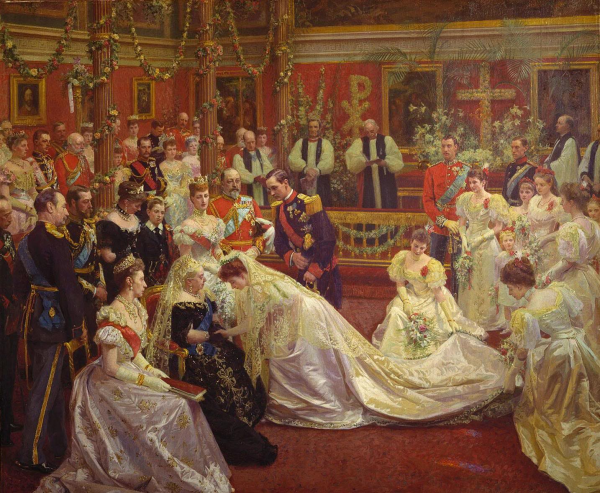 The engagement was announced in the papers on October 29, 1895, following an official announcement at a dinner in Copenhagen on the 28th and the official consent of Queen Victoria. The following day, diplomats swarmed Marlborough House, the London home of Maud's parents, jockeying to sign the official book of congratulations for the couple. Over the next few months, papers reported that the royals squabbled as they tried to set a date for the wedding. One scheduling stumbling block was the unexpected death of Prince Henry of Battenberg, husband of the bride's aunt, Princess Beatrice. Henry contracted malaria while serving with the navy in Africa, and there were conflicts in the family over whether or not the marriage could take place during the mourning period. 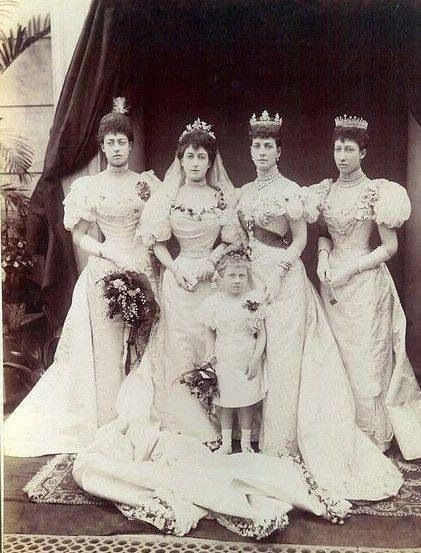 In the end, the wedding was fixed for Wednesday, July 22, 1896, and Beatrice and her children did not attend. On July 18, a yacht carrying Crown Prince Frederik and Crown Princess Lovisa of Denmark and their youngest children -- Prince Harald, Princess Ingeborg, Princess Thyra, Prince Gustav, and Princess Dagmar -- arrived in England. Their arrival was marked by decorations and a royal salute, but the subsequent trip into London turned into something of a comedy of errors. A telegraph mix-up meant that the Danes arrived half an hour earlier than expected, and the first of the welcome party -- Prince Christian (elder brother of the groom) and the Duke and Duchess of York (brother and sister-in-law of the bride) -- had just shown up as the train arrived at Charing Cross. The rest of the party -- including the bride and groom, the Prince and Princess of Wales, Princess Victoria, and the groom's just-married sister and brother-in-law, Prince and Princess Frederick of Schaumburg-Lippe -- arrived in stages afterward. After the bumbling welcome, Crown Prince Frederik and Crown Princess Lovisa headed straight for Buckingham Palace, while some of the rest of the royals traveled with the Waleses to Marlborough House. With the Danish royals in town, the pomp and circumstance could officially begin. A luncheon was held on the afternoon of the 18th at Marlborough House, with Crown Prince Frederik, Crown Princess Lovisa, the Schaumburg-Lippes, and the Yorks all in attendance. More royal guests, including Crown Prince Constantine and Crown Princess Sophie of Greece (pictured above), as well as Prince Nicholas of Greece and Denmark, arrived in London that evening. Queen Victoria, however, didn't arrive at Buckingham Palace until the 21st. She spent only twenty-four hours in London during Maud's wedding festivities. Victoria took the train from Windsor to London the afternoon before the wedding; after she arrived in the city, she stopped briefly at Marlborough House to inspect Maud's wedding gifts. The jewels Maud received were impressive. 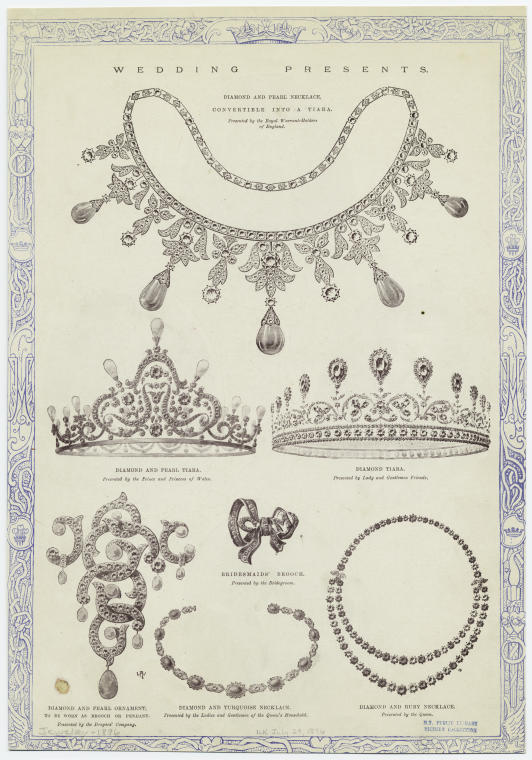 At least three tiaras were on display: a pearl and diamond tiara from her parents (now lost; a replica is with the Norwegian royals), a diamond tiara from "lady and gentleman friends" (now with the Norwegian royals), and a convertible tiara/necklace from the English royal warrant holders. She also received a ruby and diamond necklace from Queen Victoria, a diamond collet necklace from the groom's parents, and a turquoise and diamond necklace from the Queen's Household. Prince Carl gave Maud a diamond brooch; she also received a diamond and pearl brooch from Lord and Lady Rothschild, a turquoise and diamond brooch from her aunt, Empress Marie Feodorovna of Russia, and a diamond and pearl brooch from the Drapers' company. 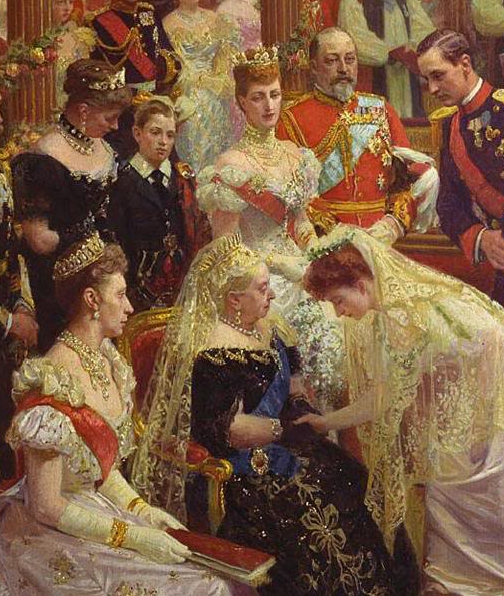 Bracelets were gifted by Princess Louise (Maud's aunt), King George I of Greece (uncle to both Maud and Carl), the Duke and Duchess of Coburg (Maud's uncle and aunt), and the Duchess of Inverness (Maud's late godmother). A dinner party was held that evening at Marlborough House for Carl and Maud's royal guests. On the morning of the 22nd, the invited guests began to assemble at Buckingham Palace, where the wedding would be held in the private chapel. Queen Victoria was already there, so she made no public appearance during the wedding processions. The rest of the arrivals were as carefully coordinated as they are at a modern royal wedding. The earliest of the royal arrivals included several of the peripheral members of the British royal family: Princess Edward of Saxe-Weimar (niece-in-law of the late Queen Adelaide); Princess Victor of Hohenlohe (niece-in-law of Queen Victoria) and her four children, the Gleichens; and Prince and Princess Adolphus of Teck (great-grandson of King George III and brother of the Duchess of York). 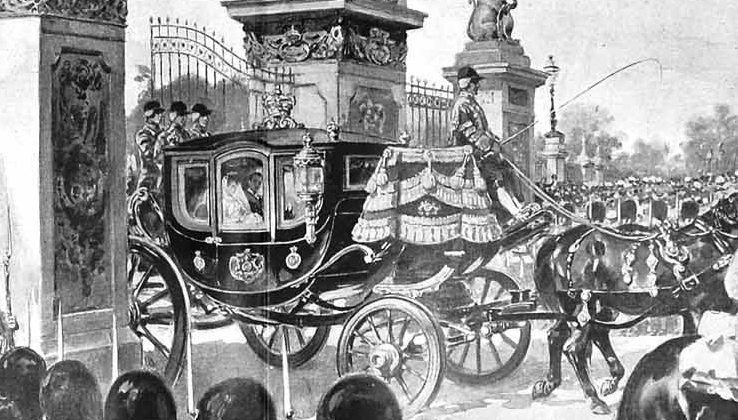 Processions began to depart from Marlborough House 45 minutes before the wedding was scheduled to begin. The first carriage procession carried the groom and his two supporters: his brothers, Prince Christian and Prince Harald of Denmark. The next procession included the Princess of Wales, Princess Victoria, the Greek crown princely couple, and Prince Nicholas of Greece. The carriages passed through streets decked with British and Danish flags. When the royals -- with the exception of the bride's procession -- had gathered at the palace, Queen Victoria led the family into the private chapel. She was accompanied by two of her grandsons, Prince Arthur of Connaught and Prince Christian Victor of Schleswig-Holstein. When the Queen's entourage had arrived in the chapel, the rest of the royals began to enter the room as follows: The Duke and Duchess of Teck; Prince and Princess Frederick of Schaumburg-Lippe; Prince Nicholas of Greece and the Duchess of York; the Duke of Fife and Princess Louise, Duchess of Fife; Prince and Princess Philipp of Saxe-Coburg and Gotha; the Duke and Duchess of Albany with Princess Elizabeth of Waldeck-Pyrmont; the Marquess of Lorne and Princess Louise, Marchioness of Lorne; Prince and Princess Christian of Schleswig-Holstein; the Duke and Duchess of Connaught; the Crown Prince and Crown Princess of Greece; the Duke of Cambridge and the Crown Princess of Denmark; and the Crown Prince of Denmark and the Princess of Wales. Prince Carl and his brothers entered the chapel next, heading up to the altar to wait for the bride. Princess Maud and her father were the last to leave Marlborough House. When they arrived at the palace, they processed into the chapel with her eight bridesmaids. The party included her unmarried sister, Princess Victoria; two of the groom's sisters, Princess Ingeborg and Princess Thyra; four cousins, Princess Victoria of Schleswig-Holstein, Princesses Patricia and Margaret of Connaught, Princess Alice of Albany; and a niece, Lady Alexandra Duff. Each of the bridesmaids received a special gift as a thank-you present from Prince Carl: a diamond and enamel brooch in the shape of a bow, with the initials "C" and "M" inside each loop. Some newspapers also identify other royal guests who attended or were "expected" to attend. 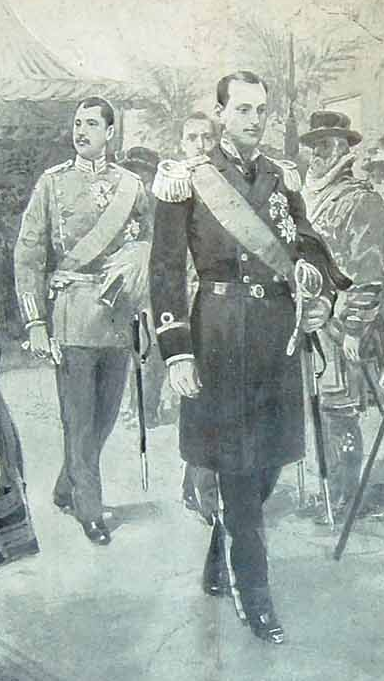 Prince Henry of Prussia represented his brother, Kaiser Wilhelm II. Some reports note that his wife, Princess Irene (who was a daughter of Princess Alice, late daughter of Queen Victoria), attended; however, she was pregnant with their second child, and some articles suggest that she stayed home because of that "delicate condition." Carl and Maud's mutual grandfather, King Christian IX of Denmark, reportedly attended. One newspaper report also names Grand Duke Ernst and Grand Duchess Victoria Melita of Hesse, the Duke and Duchess of Saxe-Coburg and Gotha, Hereditary Prince Alfred of Saxe-Coburg and Gotha, Princess Beatrice of Saxe-Coburg and Gotha, Grand Duke Serge and Grand Duchess Ella of Russia, Prince and Princess Friedrich Carl of Hesse, Crown Prince Gustaf of Sweden and Norway, and Prince and Princess Aribert of Anhalt. Princess Maud wore a wedding dress made of white satin. Rather than a tiara, she wore flowers in her hair. Her primary jewels were a choker necklace and several bracelets. 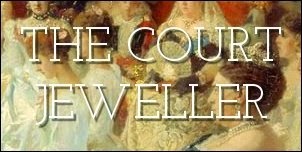 Photographs of the wedding guests, plus the Laurits Tuxen painting of the wedding (a detail of which is presented above), give us a bit of information about the guests' jewels. Princess Alexandra wore a smaller setting of the tiara from her wedding gift parure. The groom's mother, Crown Princess Lovisa, wore the Pearl Poire Tiara owned today by Queen Margrethe II of Denmark. Queen Victoria wore her small diamond fringe tiara, later inherited by Princess Beatrice; she also appears to have worn the coronation necklace and earrings, plus her ears of wheat brooches, all of which are still in the British royal collection today. The bride's sister, Princess Louise, Duchess of Fife, wore the glittering Fife Tiara. The Archbishop of Canterbury, Edward White Benson, married Carl and Maud. Music was provided during the service by the musicians and choir of the Chapel Royal of St. James's Palace. When the ceremony concluded, the new Prince and Princess Carl processed out of the chapel to the strains of Mendelssohn's famous wedding march. 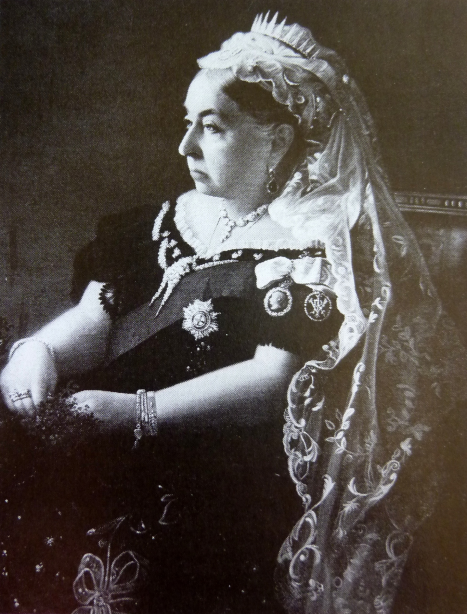 After the registry was signed, Queen Victoria promptly departed. A pair of luncheons were held at the palace: one in the state dining room for the royal guests, and one in the ballroom for, it seems, everybody else. After that, Carl, Maud, and Maud's parents received a long line of guests in the Picture Gallery.